We can’t really figure out why this product exists, but for some reason we kind of want one. It’s a bottle opener that doubles as a cap collector – so you can prove how many beers you’re able to hold in your gut, show off your taste in imported brews or just save the caps for some weird art project you’ve got in mind like tiling your entire entryway in recycled beer caps. 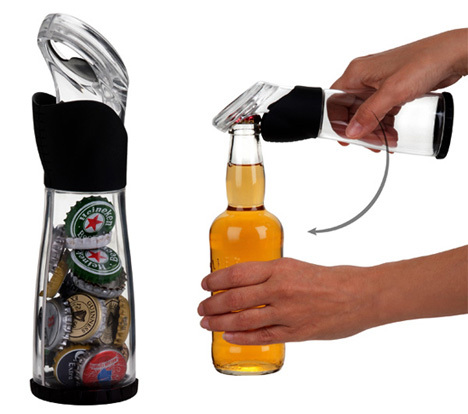 This gizmo can hold up to 30 caps, so if you’re drinking alone you won’t even need to empty it all that often. To be fair, opening your beer bottles can be a bit of a pain…particularly when you’ve already had a few. Those caps tend to go skittering off across the floor and you can’t find them until the next time you’re walking around barefoot in the dark, at which point they announce their presence by embedding themselves in the soft flesh of your arches. Kudos to you, Trudeau Corporation, for fixing a problem we weren’t even aware that we’ve always had! See more in Home & Personal or under Gadgets. February, 2012.